Spanish architect Javier Peña of Xpiral has completed two houses in Murcia, Spain, with the lower volume built from stacked ceramic wine racks. 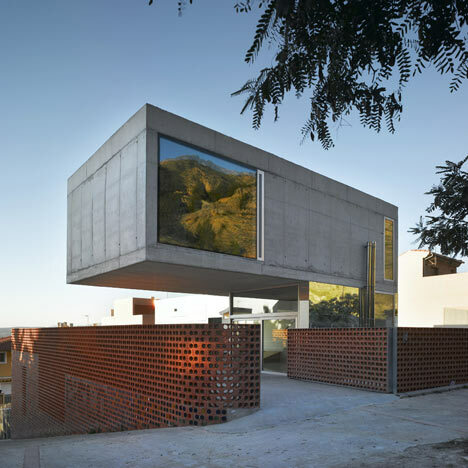 Called Torreagüera Vivienda Atresada, the project comprises two residences, with one cantilevered above the other. Some of the holes in the wine racks that make up the lower level are plugged with coloured ceramic tiles. Photographs are by David Frutos. The two houses are built in height, using the full width of the parcel. The architect named this concept as “vivienda atresada”, exploring the concept of geminated houses in height. The house that develops from the facade of the main street is named as house of the ´land´, while the house “sky” is facing the mountain. The innovative facade is made wine rack made of ceramics with circular tiles that close the holes of the wine racks, controling the visual and climate permeability of the house. These ceramic pieces are an innovative design of Xpiral Office.